Idaho's cold climate, high altitude and short growing season can make local fruit production a challenge. However, gardeners can find a selection of cold-hardy fruit trees that survive well throughout the state. As of 2010, the Idaho Department of Agriculture quarantined apricot, plum, peach and nectarine plants imported from certain states to keep diseases out of Idaho. The state encourages home gardeners to purchase these trees from Idaho nurseries. Apples are among the few fruit trees that can grow in nearly any part of Idaho. Because they are well adapted to cold temperatures, certain apple species can grow even in the northernmost parts of the state. In southern Idaho, some soils may need to be modified with lime to produce the slightly acidic environment that apple trees thrive in. McIntosh, Honeygold and Golden Delicious apples grow particularly well in Idaho's climate, but numerous other varieties are also recommended. While not as cold hardy as apple trees, apricot trees can tolerate temperatures as chilly as minus 25, making them well suited for southern Idaho. Keep these trees out of frost pockets by planting them on slopes facing away from the wind. A few must-try varieties include Harlayne, Harogem and Moongold. Peach trees struggle to survive in the high altitude of Idaho's mountains, but they grow fairly well in southern and western Idaho, where the blooms are less likely to be damaged by frost. Plant these trees in well-drained soil in areas where temperatures consistently stay above minus 15 degrees. Nectarines, close relatives of peaches, require similar growing conditions. August Lady and Autumn Glo are two recommend peach varieties. For nectarines, try Arctic or Summer Fire. Plums require growing conditions similar to those of peaches and nectarines. The Fortune and Empress varieties of European plum and the Black Amber variety of Japanese plum are successfully grown in Idaho. Plant two of these varieties together, as they require cross-pollination to produce a crop. While sweet cherries can only survive in southern Idaho, tart cherries thrive anywhere in the state. Despite being more temperature sensitive, sweet cherries are commercially grown throughout the southern parts of the state. 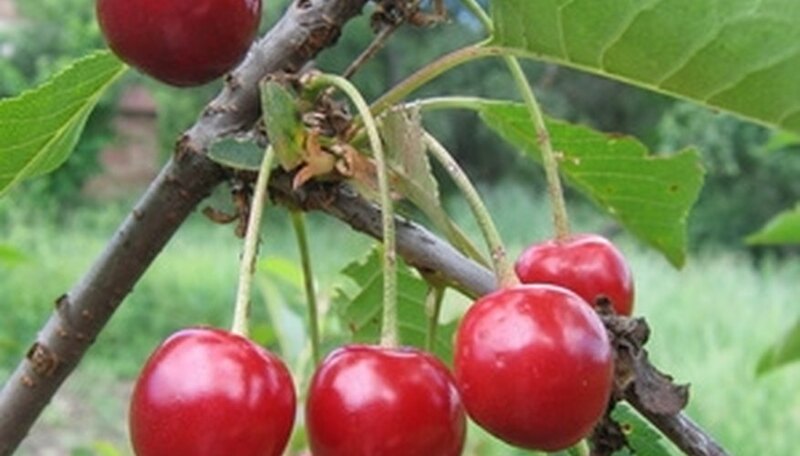 Commonly grown sweet cherries include Hendlefingen, Hartland and Starkrimson. For tart cherries, try Montgomery, North Star and Meteor. Both standard pears and Asian pears grow well in certain parts of Idaho. However, standard pears are significantly more cold hardy than Asian pears. Pear trees prefer slightly acidic, well-draining soil. When choosing a variety, look for one that is resistant to fire blight, a disease that plagues many pear varieties. Warren, Maxine and Magness pears are all resistant to fire blight.